I recently visited the city of Oaxaca, the capital of the State of Oaxaca, in Mexico and had the chance to view the 18th Biennial of Painting Rufino Tamayo at the Museum of Contemporary Arts of Oaxaca (MACO, Museo of Artes Contemporaneos de Oaxaca). Founded in 1982 by the internationally known Oaxacan artist, one of the most outstanding artists of Mexico, the Biennial, which bears his name, was born from his desire to promote and strengthen the pictorial expression in Mexico. It aimed from the beginning at encouraging the voice of painters older than 35, from all over the country, irrespective of origin, background, formation or notoriety and to represent as such a meeting place for Mexican art. The Biennial has usually reflected the various tendencies of fine arts in the country, an event where the different manifestations of contemporary art converge. Until now it has limited itself to the medium of painting, painting considered as the root of the different forms of art, a decision, however, that may possibly change in the future to include other art techniques and mediums. Based on the visionary view of Tamayo that art had to be multifaceted, multiple, poetic, universal, free and young, and that it had to reflect the societal, political and global changes occurring both in the country and in the world, every two years jurors select among the many submitted works, diverse artworks that represent not only the various forms and painting techniques of pictorial expressions in Mexico but also and as importantly the different sociopolitical problems going on at the time. For this 18th edition, the jury reviewed works submitted by 635 artists from all over Mexico and selected from them 48 works by 45 artists. Their selection criteria included self-reflection, esthetic maturity, contribution to the history of recent art, awareness and reflection of current events and of global order. They also gave merit to humor and to the ability to develop in a convincing way hot topics of today’s sociopolitical environment. After Oaxaca, the Biennial will travel for a year to various museums of Mexico, closing at the Museum Tamayo in Mexico City, at the end of 2019. Even though limited in the number of pieces selected and displayed I found the exhibit to be of high technical and esthetic quality and quite diverse in its approach and its pictorial handling of the various themes. These themes ranged from local issues pertaining to the marginalized individual and to the prevailing violence, to global issues such as questioning where we fit in this world and general criticism of capitalism. 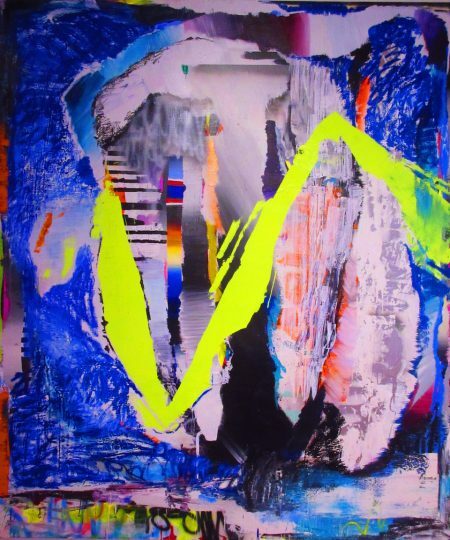 A few pieces at first encounter were just abstract and colorful expressions fitting within worldwide contemporary and conceptual approaces to art. 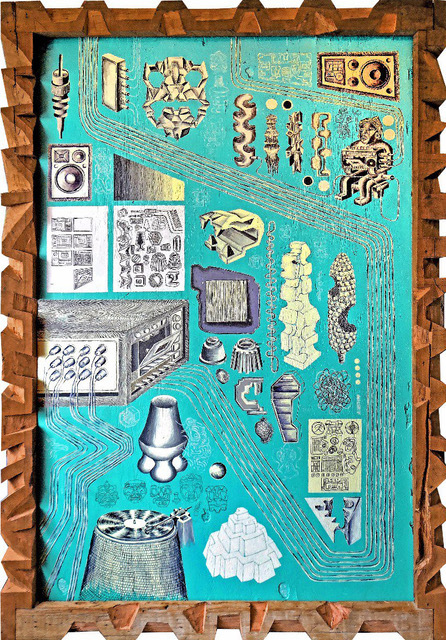 One of the winning pieces titled Double Archeology (Doble Arquelogia) consisted of a large, 77×53″, acrylic painting on wood displayed in a wooden frame carved by the artist himself, Francisco Javier Jimenez Hernandez. At first site, its pale blue aquamarine background and its various monochromatic painted objects neatly arranged and as if floating on its surface, evoke a contemplative and reflective mood. Spending more time deciphering its various elements, their relationship and the reason for their coexistence, a narrative tale emerges, with references to the remote past (MesoAmerican civilizations represented by a Mayan figure, a pyramid, etc.) 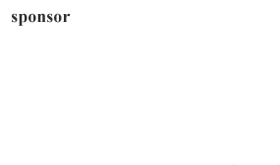 and to more recent technological objects which have become obsolete (such as a turntable, a radiorecorder, etc.) and lead the way to virtual paths ending blindly at the edge of the frame, as if getting lost in the cosmos. By its size, its colors and its pictorial display referencing the past, the piece imposes a dreamy and nostalgic atmosphere, pushing the viewer to reflect on current times, on what is gone and being missed, and on resulting isolation and disconnectedness. In Humors I (Humores I), an Honorable Mention awarded oil and transfer painting on wood by Angela Leyva, the artist addresses the related theme of disintegration of the individual. The human face is represented fading, imperceptible, ghostlike and haunting the viewer. It questions the increasingly disappearing role and diminishing importance of the human being in our modern society. 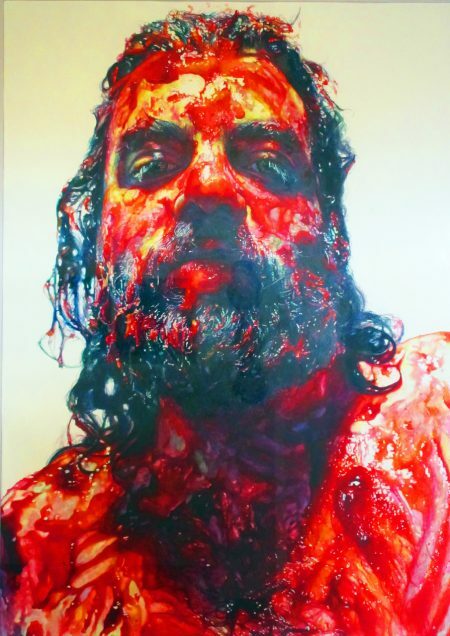 Paulina Jaimes goes even further in her stunning portrait of Jonathan, a large watercolor on paper, in which the face and the upper chest of its subject are nearly entirely covered in red, almost disappearing behind thick patches of what appears to be blood. It may be her statement regarding the destructive assault on the human condition, attacked, wounded, bloodied and progressively effaced. 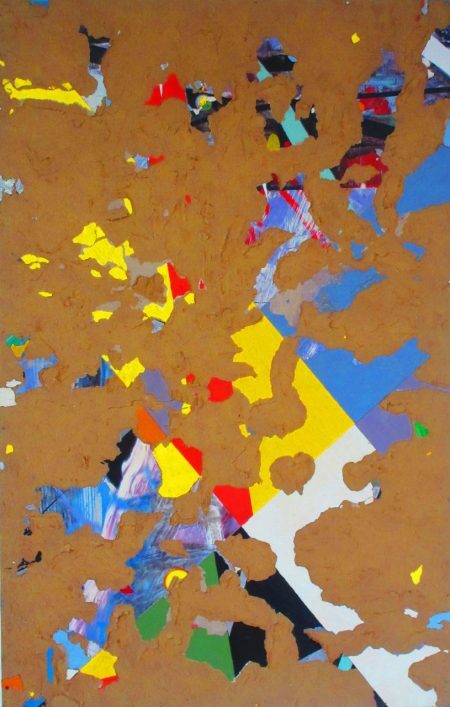 Gerardo Monsivais Flores in his SuperMegaDevelopment (SuperMegaDesarrollo) mixed media enamel and oil piece on canvas, extends even further the reflections on identity dissolution. 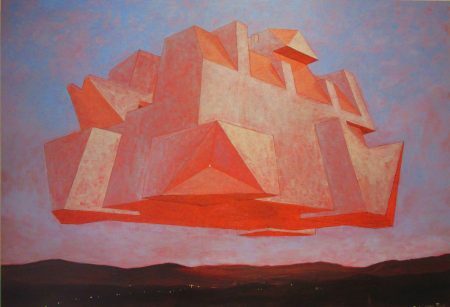 He isolates and imprisons humanity in a futuristic structure, opaque, disconnected from, and floating above the earth. Some art pieces made political statements and addressed critically issues raised by the prevailing consumerism and capitalism of our culture. 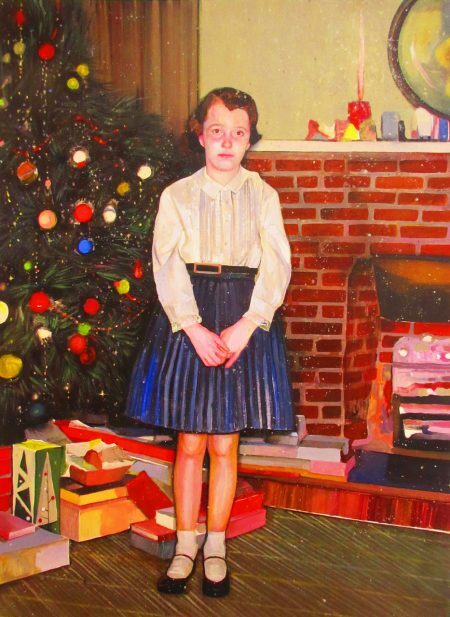 My present (Mi Regalo) by Rafael Rodriguez, an oil on canvas painting, represents a sad looking girl standing rigidly in front of a richly decorated Christmas tree which has at its base a large number of wrapped gifts. 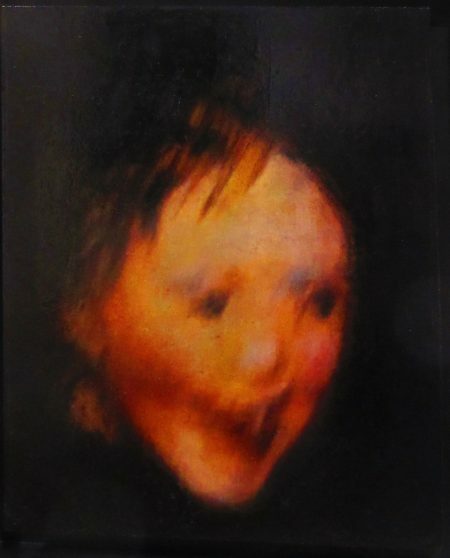 The contrasting mood of the painting is ironic as one would expect a radiant and happy child, and not a resigned and disconnected one, in front of the plentiful presents. The artist’s statement, however, seems to be clear, reminiscing on the little joy and happiness that consumerism and capitalism bring nowadays to society, the majority of its members passively forced to bear their negative effects. 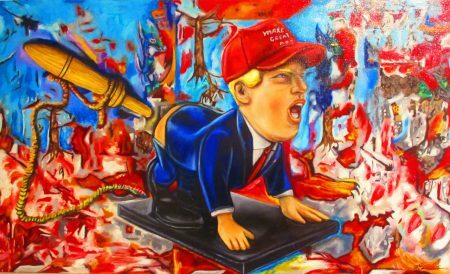 In Take My Capitalist King (Toma Mi Rey Capitalista), an acrylic painting on canvas, Charles Glaubitz Gonzales makes a similar assertion. 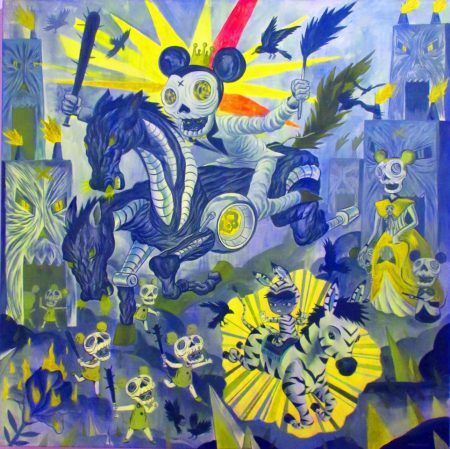 He depicts a chimeric dysneyesque king, riding a two-headed mechanical horse, galoping over a kingdom of skeleton-like subjects. His subjects, however, instead of welcoming him, are facing another gentler and more humane leader who is riding a real pony. The artist is inviting the viewer to turn away from the false and deadly promises of capitalism and to look elsewhere for a real and better alternative. Rosalinda, an oil painting on canvas with newspaper collage, by artist Sylvia Mayoral Marina, addresses the issue of daily and random violence that increasingly affects individuals in our society, an unexpected deadly violence that suddenly destroys their peace, their lives and those of their acquaintances and loved ones. By using a woman’s name as a title, Marina also points indirectly to the physical and sexual violence women are exposed to in our modern society. 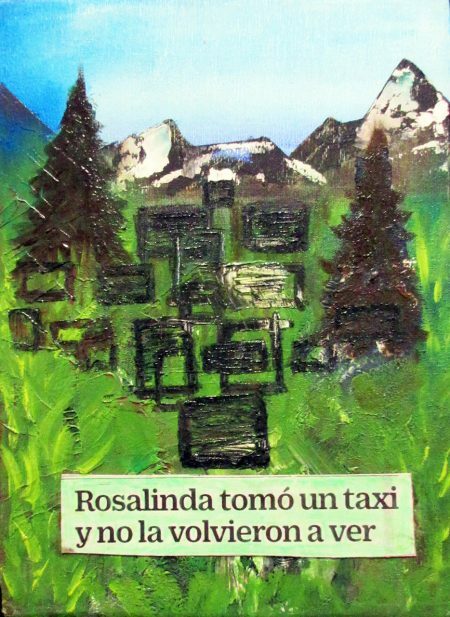 Also a winner in the Biennial, the painting, very simple and yet quite powerful in its composition, shows a somewhat idyllic and peaceful natural setting, with mountains, grass and trees, with in the forefront and in big ominous letters a reminder that this peace can be suddenly taken away and destroyed: “Rosalinda took a cab and was never seen again” (Rosalinda tomo un taxi y no la volvieron a ver), the words loudly proclaim. Other paintings address the violence caused by politics, also by current events such as migration and its resulting cultural and human desintegration. Allan Villaviciencio also received an Honorable Mention for his oil, spray and acrylic painting on canvas titled Ripped Spaces III. Abstract and conceptual in its approach, the painting represents, in a beautiful composition and with contrasting colors, what can be imagined as several layers of torn spaces. Are they the spaces that our new global order is ripping all over the world? Are they the result of our deharmonizing and destructive politics, tearing apart civilizations and populations? Are they the immediate cause and manifestations of our migration crisis? In his Reconfiguration I (Migration, Substraction of Color, Arid Earth) (Reconfiguracion I (Migracion, Sustraccion de Color, Tierra arida)), in acrylic and enamel, David Alejandro Valdez Meraz addresses the same issues of fragmentation and destruction of the world, representing what look like geographic maps being torn apart, fragmented, haphazardly and disorderly reconfigured. Gone are the preexisting harmony and peace. Juan Caloc, in a simple, clever and conceptual way addresses also the issues of separation, of cultural division, of immigration. 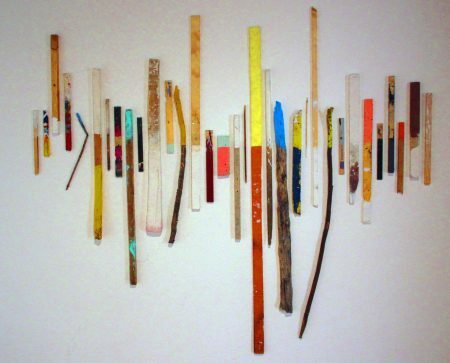 His mixed media piece The Mexican, to be split in half is a particular form of disintegration (El Mexicano, ser partido por la mitad, es una forma particuliar de desintegracion) consists of an assemblage of wooden sticks painted in sections with different colors, mounted side by side on the wall, the separating lines of their dividing colors all hung at the same level. Their assemblage creates the impression of an entity divided in two unequal parts, separate even though connected. It reflects on the condition of many individuals and/or populations torn apart by a conflictual reality. 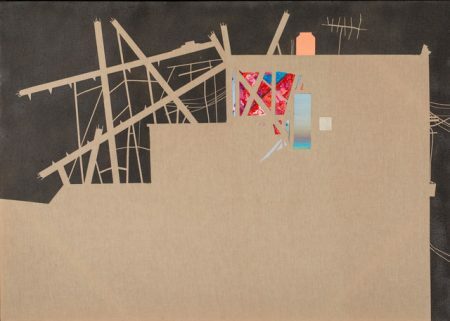 Even though the majority of the artworks included in the Biennial show were obscure, heavy and pessimistic in their outlook, one at least conveyed some happy and hopeful optimism; it was Explosion by Mauricio Gomez Velez, an acrylic painting on amate paper. 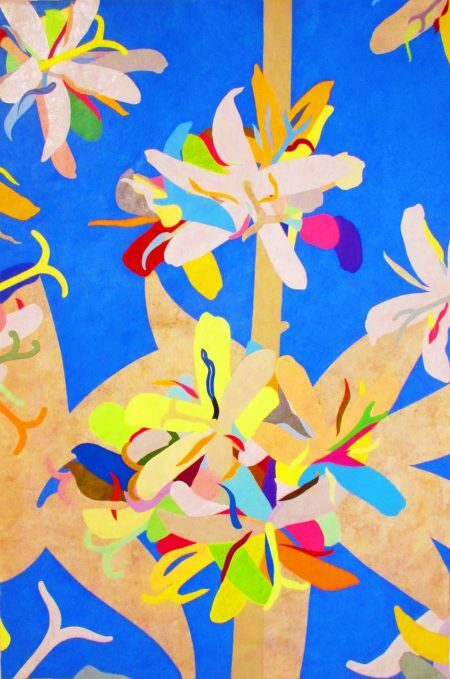 Despite its name that one usually associates with violence, the explosion represented here is that of blooming colorful flowers ready to fill the canvas space, and hopefully the universe. Many other artworks of significance were included in the show. They all gave a good idea of the vitality, originality and diversity of the pictorial art expression in Mexico, a very skilled expression yet a timely one, very much engrained in the prevailing local and global social reality that the artists live. The biennial in its 18th edition would have thus succeeded once more at realizing what Tamayo aimed at in creating it 37 years ago.